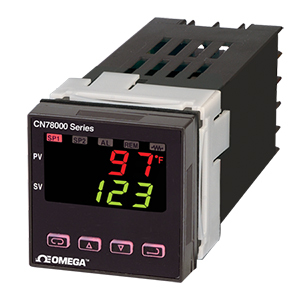 The CN78000 Series process controllers are fully programmable compact units with a variety of features that include: universal input, self-tune PID, fuzzy logic and dual 4-digit LED displays for process and set point values. User can select from thermocouple, RTD, current or voltage inputs AC SSR, relay, DC pulse, and proportional current outputs. A programmable alarm (optional) can be reset automatically or manually. The front panel is waterproof and corrosion-resistant (UL Type 4-X), making it ideal for sanitary applications. Electronics can be replaced without wiring changes through a removable front panel. Self-diagnostics, nonvolatile memory and selectable control modes are all also available and greatly increase productivity. Four security levels are password protected. For optimal PID control, the on/off, P, PI or PID manual-tune control functions can be selected, or the controller will autotune automatically. The CN78000 offers an excellent array of standard features as well as peak/valley indication, percent output indication, digital input filter, among others. Note: All thermocouple and RTD inputs can be set for 0.1° display. If temperature goes above 999.9° or below -199.9°, the display will return to whole-degree resolution. * Process Input Types: The 0 to 20 mAdc, 4 to 20 mAdc, 0 to 10 Vdc, 2 to 10 Vdc, and -10 to 10 mVdc inputs are fully scalable from a minimum of 100 counts span placed anywhere within the range of -1999 to 9999. Decimal point position is adjustable from the zero place (9999), tenths (999.9), hundredths (99.99) or thousandths (9.999).